There were many things that were disappointing about President Obama's first term. Obama's failure to submit a budget on time. The Senate's failure to pass a budget in nearly four years. Failure to keep the ObamaCare transparency promise. Failure to keep his promise to reform immigration during his first year. There was much to bedisappointed about during Obama's first term. But the most disappointing thing about Obama's first term was the irresponsible and out of control spending. Today, the national debt is $16,432,631,489,854.70. It was $10,626,877,048,913.08 when Obama became president. That is an increase of more than a 5.8 trillion dollars during Obama's first term. In 2004, when the deficit was $413 billion and the national debt was $7,419,244,676,835.15 or $7.4 trillion, Obama said the "monstrous federal deficit" was an "enormous problem." On July 3, 2008, presidential candidate Obama said that adding $4 trillion in debt was "irresponsible" and "unpatriotic." Nevertheless, President Obama added more than $5.8 trillion to the national debt in four years. February 23, 2009: Obama Pledges to cut the deficit in half by the end of his first term in office. February 24, 2009: Obama pledges to cut the deficit in half by the end of his first term in office. December 8, 2009: Obama pledges to cut the deficit in half by the end of his first term in office. February 14, 2011: Obama pledges to cut the deficit in half by the end of his first term in office. You shouldn't be shocked by Obama's failure to reduce the deficit in half by the end of his first term in office. He did warn us there would be "trillion-dollar deficits for years to come." The president and his Obamacrats need to get serious about the irresponsible spending. Obama has not submitted a single budget on time. And when Obama's budgets are submitted they are so "unserious" that for the last two years they haven't even received a single vote in the Democrat-controlled Senate. And the Senate hasn't passed a budget in 1,365 days, almost four years. Congress has failed to adequately address the problem by continuing raise the debt limit and borrow more and more until we now have a $16.4 trillion national debt. Can we continue down this road and avoid bankruptcy? Does Hillary have the experience necessary to be Secretary of State? Craig belittled Hillary's exaggerations about her foreign policy experience in Bosnia, Kosovo, Northern Ireland, Rawand, the 1995 speech Hillary gave in China, and Hillary's silly assertion that her vote for the “The Joint Resolution to Authorize the Use of U.S. Military Force Against Iraq,” -- that she wasn't actually voting for war, she was voting for diplomacy. Bill Clinton made a political blunder of monumental proportions when he claimed that he "opposed the war in Iraq 'from the beginning,'" A statement even the New York Times found "is more absolute than his comments before the invasion in March 2003." "Former President Bill Clinton accused President Bush of spending more time fighting the war on terrorism than on domestic issues during a commencement speech at Tougaloo College. 'I supported the president when he asked for authority to stand up against weapons of mass destruction in Iraq, but we can’t be forever strong abroad if we don’t keep getting better at home,' Clinton said Sunday to a crowd of about 8,000. 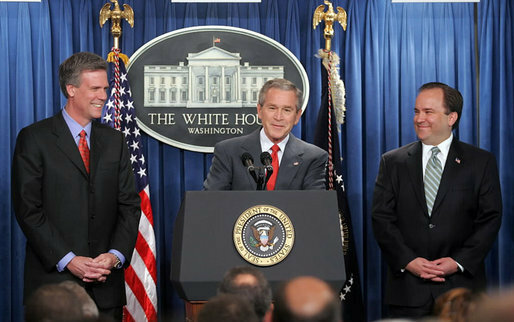 […] The Bush administration, Clinton said, 'is still focused on defeating terrorism and weapons of mass destruction, and that’s good, but not good enough. The power of our example is just as important as our military might.'" Clinton may have questioned the timing of the invasion, but Clinton didn't oppose it "from the beginning." The former president's blunder could not have come at a worse time for Hillary's race for the presidency. Her campaign has stalled. In Iowa Obama has tied Hillary in the most recent polling, some are predicting Obama will beat her in Iowa, and Hillary is bracing for defeat. As Hillary campaign teeters on defeat and needs to rely upon the political prowesses of the infamous "comeback kid," he stumbles. Clinton reminds everyone, as Hillary's Democratic opponents continue to repeat - the Clinton's have trouble giving straight answers - Clinton admitted that answers he gave about Ms. Lewinsky during a 1998 deposition were false and that he "knowingly gave misleading and evasive answers." For the extremist Liberal/Progressive Democrats Defeatocrats the timing is even worse. Now, on top of all the reports about the progress in Iraq Clinton has provided an opening to refute the left wing's attempt to rewrite history with the false allegation that we were mislead into the war. Thanks to Clinton's latest lie, we will be reminded again and again that everyone thought Saddam was much too dangerous to be allowed to keep the weapons of mass destruction everyone believed he still had at the time of the invasion. Also Posted at RedState and Examining Presidential Politics. Snow told conservative talk-show host Hugh Hewitt on Thursday "financial reasons" may prevent him for serving the remainder of his boss's presidency. "I'm not going to be able to go the distance, but that's primarily for financial reasons." Snow said. "I've told people when my money runs out, then I've got to go." According to the Associated Press, Snow, the father of three children, earns $168,000 as an assistant to the president. He made considerably more as a pundit and syndicated talk-show host on Fox News Radio. Snow has been a phenomenal press secretary. We wish him all the best.